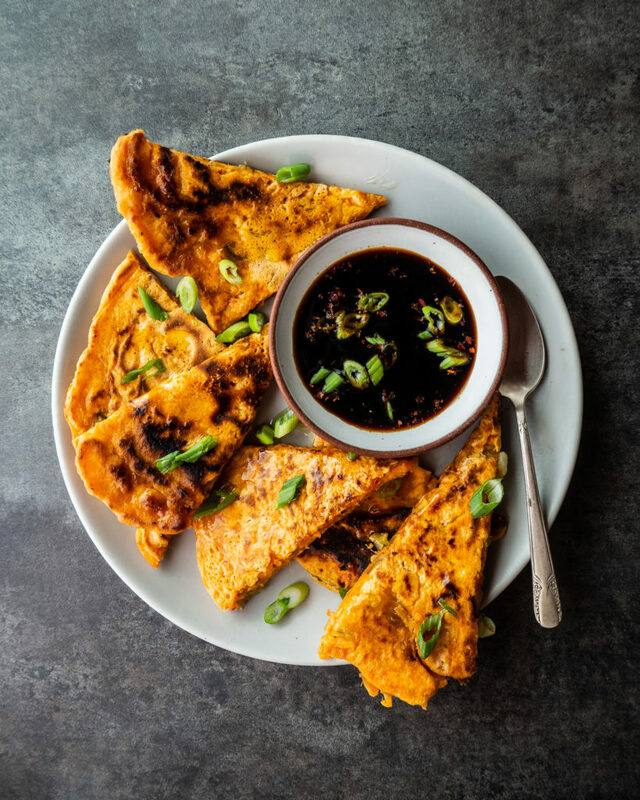 I am so excited to share this recipe for Kimchi & Scallion Pancakes from the Pollan Family’s new cookbook Mostly Plants: 101 delicious flexitarian recipes from the Pollan Family. This recipe was a real treat and a total breeze to whip up. It’s the perfect appetizer with a cold beer or can be a complete meal if you serve it with some steamed rice and veggies. I love how flavorful these little pancakes are and I hope you all enjoy them as much as we did. If you head on over to my Instagram page my publisher (HarperCollins) and I are giving away a copy their book. In order to win please leave a comment on my Instagram page with what vegetable you’re most looking forward to picking up at the farmers market this spring. Prepare the dipping sauce by combining all the ingredients and whisking until well incorporated. Set aside. In a large bowl whisk together the two flours, salt, egg, seltzer, and kimchi liquid and mix well to incorporate. Add the kimchi, scallions and red chili pepper and stir. Heat 1/2 tablespoon of the oil in a large non stick skillet over medium high heat. Once shimmering scoop about 1/2 cup of the batter into the skillet and cook, undisturbed for about 2 minutes. Flip and cook for 2-3 minutes longer. Place the pancake on a baking sheet and keep warm in the oven. Repeat the process with the rest of the batter. Hi Andrea, how much kimchi should be mixed into the pancakes? Thank you! Yum yum! I will try these with gf flour. The recipe says how much kimchi liquid, but not how much kimchi. Kimchi isn’t listed in the ingredient list, how much should be added? This will definitely be in my kitchen soon! I want to point out how unhealthy canola oil is though and that nonorganic canola is likely a GMO product. Thanks! If you’re uncomfortable with canola oil then you can simply use another oil. I hope you enjoy these pancakes from the Pollan Family’s cookbook. Bet this would be good with Blue Bus Krautchi!